Vertical tower cable encased in Nycoil™ flexible tubing eliminates tangling and stretching while protecting the mast wiring from cuts and abrasions. 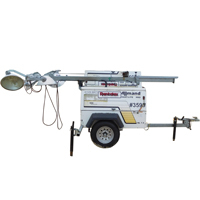 SHO-HD parallel lamp fixtures provide more lumens per fixture than competitive light towers. SLS™ Sequenced Light System™ provides control for the sequencing of the lights on and off and provides controlled engine shutdown for high coolant temperature and low engine oil pressure. 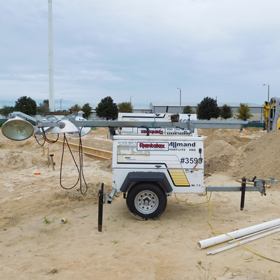 Four-point outrigger system provides enhanced stability in windy conditions.